Ideal for the Australian climate, these classic interior shutters get their name from the cotton plantations of the American South where they first appeared on homesteads in the early 1800s. Designs and construction methods have come a long way since then, but many modern interior plantation shutters are still painted and finished in that pure, clean white which lends an inimitable feeling of coolness and lightness to any room. PVC shutters have significantly increased in popularity over the last few years. With competitive pricing, durability and versatility, PVC Shutters are hard to beat for all internal applications. Timeless and sophisticated Timber Shutters are a completely customisable, top quality and durable window and door furnishing that will radiate charm for years to come. Ideal for both interior and outdoor environments, our popular aluminium shutters are available in two different ranges — commercial grade and standard residential aluminium shutters. 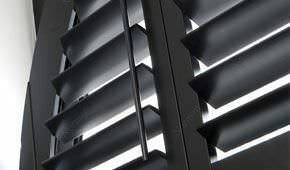 Plantation shutters are designed with warm climates in mind, which is why they offer excellent control light and airflow throughout the day with their easy-to-operate moveable blades. In addition to allowing outstanding control over natural light and ventilation, plantation shutters are also widely considered an excellent investment in curb appeal. As they’re permanent fixtures, attractive indoor plantation shutters can actually enhance the value of your home. 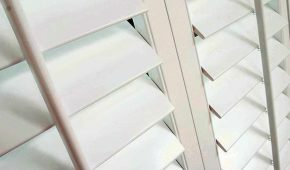 The Blinds Place offers premium-quality, custom-made indoor plantation shutters on the Sunshine Coast, in Brisbane and Melbourne. Installing plantation shutters at home does so much more than provide a functional shade solution that keeps your interiors cool and comfortable, stylish custom plantation shutters lend an air of class to all indoor environments. From iconic Queenslanders and 1920s bungalows to contemporary beach houses and inner-city townhouses, just about any property looks elegant with this simple, clean and cost-effective shade solution. A wide range of materials are available with our custom plantation shutters range, including beautiful natural wood, with appealing timbers. All our premium-quality, cost-effective interior plantation shutters are complemented with stainless steel hinges that won’t rust, making plantation shutters the ideal window solution for coastal areas of Queensland and Victoria. Along with a fantastic selection of interior window solutions, including traditional-style white wood plantation shutters, The Blinds Place also offers aluminium plantation shutters for outdoor use. Available at the best prices you’ll find anywhere in Melbourne, Brisbane or the Sunshine Coast, our external aluminium plantation shutters are a great choice for decks, pergolas and alfresco areas. Because The Blinds Place is an independently owned and operated company, we not only offer the best plantation blinds prices but can also tailor our service to suit your needs — there’s no such thing as standard plantation shutters with us. 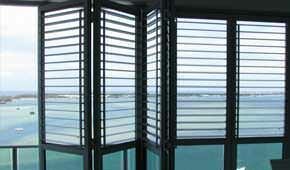 You can view samples of our entire plantation shutter range at our Maroochydore and Moorabbin showrooms. However, for the ultimate VIP experience (and a more personal service tailored to your needs), we recommend booking a free in-home consultation at a time that’s convenient for you. Call your closest showroom to schedule an appointment or complete our online contact form and we’ll get back to you as soon as we can. Please feel free to contact our team today for more information about any of our products. Simply call (03) 9556 1655 (Moorabbin) or (07) 5475 4199 (Maroochydore) to speak to one of our staff members who’ll be happy to answer any questions you have. You may also send us a message through our contact form. Locally owned and operated, The Blinds Place is dedicated to providing our customers with excellent service and an outstanding range of quality products. Our range includes awnings, blinds and curtains, along with security doors and a fantastic selection of plantation shutters, including aluminium, ABS and wooden shutters. We also have an online DIY store if you’re planning on installing your new window furnishings yourself. I am delighted with my new plantation shutters and have ordered more for the rest of the house. Both Leon and the fitter were both very professional and know their product comprehensively. I contacted the Blinds place as I was seeking 'NORMAN' plantation shutters to match some existing ones that were already in the house. The Blinds Place seemed one of the few companies that had these. Leon came over to give me a quote and I found him to be excellent. He knew exactly what he was talking about and was able to give some very helpful advice. I proceeded with the order straight away. Stefan and his father that installed the shutters were very nice men and they did an excellent job of installing them. I've had a lot of positive feedback about the way they look so I'm happy! Our place looks amazing now that our shutters have been installed. Everyone was professional, easy to communicate with and friendly. We love our Roman blinds made by Blinds Place. We were uncertain about the best option for us, and confused by the numerous conflicting views from other manufacturers. So we were pleased with the thoughtful and honest guidance from Blinds Place. The service was excellent from the visit to the Showroom to measure, quotation, installation and post sales follow up. Our calls about details of the making process were welcomed and answered precisely. The small problem we had was rectified promptly without question. The blinds are made to a high quality and work well. We would happily use Blinds Place to make future blinds for us. Great company to work with and good quality product. Irene from the design side came out and really knew her stuff, gave me great advice and helped me pick colours and designs that really suited our house. The guys who measured and installed were also great, you could tell they knew the product ins and outs and what would work best from the install and fit side of things. The installers even removed all the boxes the blinds arrived in, which doesn’t happen nowadays! The only small gripe I have is that the installers left sawdust from drill holes everywhere. Would have been nice if they had cleaned up after themselves. Other than that small negative, very happy with the products and the service. Great service from Ben. Excellent range of window coverings, styles and fabrics. Leon the sales person was very helpful and professional talking me through the selection of fabrics and giving me choice of colours for the hardware. He also recommended a slimline double blind bracket that was perfect for my window so I could fit both a blockout and privacy blind in my windows. The office staff were also professional and Leon organised for me to drop into their showroom in Moorabbin to make sure I was happy with my colours and could see samples of what I was getting. The Blinds Place were also the cheapest out of 6 quotes I had. The production of my blinds were 2-3 weeks as stated by Leon and the installation guy was on time and did a fantastic job. I am extremely pleased with the result. I needed a whole house of blinds for my new home, The Blinds Place helped me to keep within my budget but providing quality products, love the new shutter blind venetians in the bedrooms so versatile. Thanks to The Blinds Place your team were so wonderful to deal with. I now have two beautiful shutters in my children’s bedroom. They look amazing and have brightened the room so much. As a landlord and needing to replace blinds urgently in my rental property I was referred to The Blinds Place. I purchased blinds from their ready made collection of venetians and found them well within my budget. I was amazed at the quality for the price. Shopped around and had a few quotes for my Roller Blinds. But I found The Blinds Place the best. However I did not buy just on price. The service and the amount of information I was given from the consultant made me feel very comfortable that I knew exactly what I was getting, and when they were installed met all my expectations. Thank you for my new shutters they are just awesome, The Blinds Place were easy to deal with from the consultant to installer a good company, good products. Thanks so much. Thank you The Blinds Place I couldn’t be happier with the blinds you installed in my whole house. Right from the first call to the office, seeing the consultant and then the installation. A special thanks for your professionalism and knowledge of your products. Wouldn’t hesitate to recommend you. I couldn’t be happier with my shutters from The Blinds Place. Great price, great service would thoroughly recommend you. The Blinds Place Queensland is now part of Image Blinds, click here to be directed to the Image Blinds website. If you are an online DIY customer click here to continue to the online store.